2. Select the drop-off location from Hakone-en Garden, Odawara Station, [in 2018] Shinjuku, or [in 2019] Ginza. 4. Select a departure location from Grand Nikko Tokyo Daiba (Odaiba), Grand Prince Hotel New Takanawa, [in 2018] Osaki Station West Exit Bus Terminal, or [in 2019] Sheraton Miyako Hotel Tokyo. 5. Convenient Wi-Fi service is available on board the bus. 2. If the minimum number of participants (1) is not met by 4 days before the scheduled date, the tour on that date may be cancelled. 3. If Mt. Fuji's 5th Station cannot be reached due to road surface freezing or an accident on the Fuji Subaru Line, the tour will be taken to the highest elevation point possible. No alternative destinations are planned when the tour reaches beyond the 1st station. 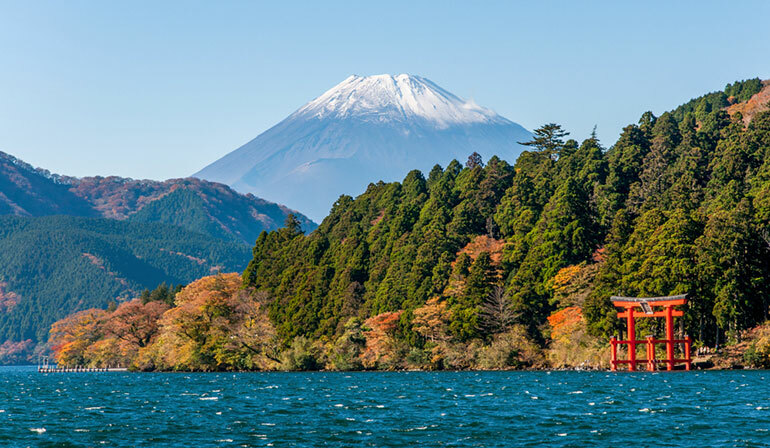 When the tour has to turn back at the 1st station, or when the Fuji Subaru Line is completely blocked, the tour will visit Fujisan World Heritage Center or Lake Kawaguchi Oishi Park. Please note that an alternative itinerary may also be omitted depending on road conditions. 4. Mt. 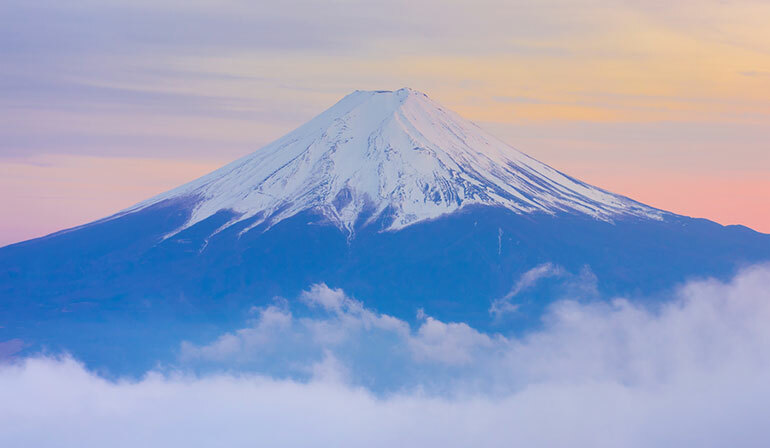 Fuji's 5th Station is typically 10 to 15 degrees Celsius colder than Tokyo. On tours from autumn to spring, please bring a coat and other warm clothing. 5. Due to weather conditions, Mt. Fuji may not be visible even from the base. However, the tour will not be cancelled and refunds will not be given for this reason. 6. 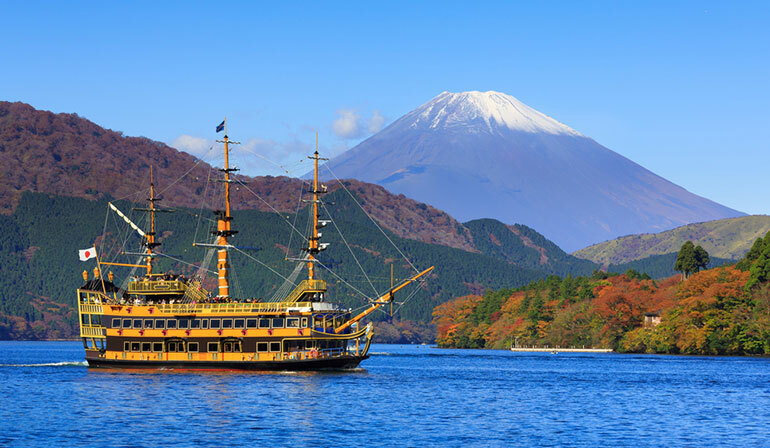 If the Lake Ashi Cruise or Komagatake Ropeway are not running due to inclement weather or maintenance, or as a result of events, road or organization circumstances, they may be omitted and replaced with one or more of the following. This will not be used as a reason to cancel the tour, and refunds will not be given for this reason. Hakone-en Aquarium, Hakone Ropeway, Owakudani Valley, Hakone Pirate Ship, Narukawa Art Museum, Hakone Checkpoint, Lake Kawaguchi Cruise, Mt. 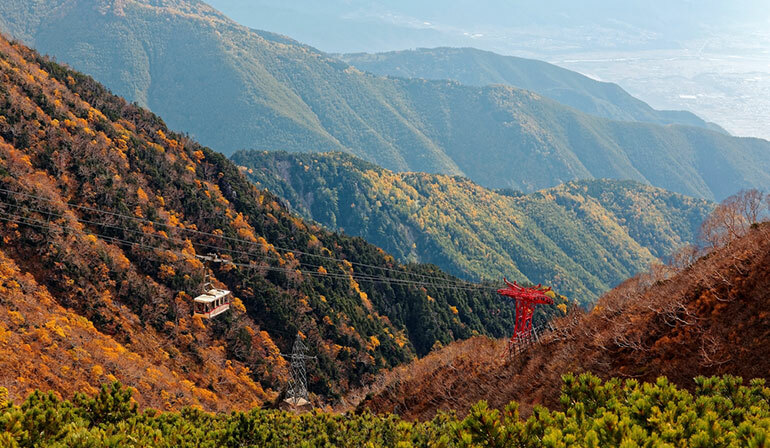 Kachi Kachi Ropeway, Itchiku Kubota Art Museum, Hakone Shrine, etc. 7. On the day when the annual Mt. Fuji Hill Climb is held, which is usually on a weekend in June, the Fuji Subaru Line is closed until around 14:00. The tour will proceed on this day, and will head to Mt. Fuji 5th Station once the road is open to traffic. Because of this, there will be changes to the itinerary order and sightseeing locations. Please note that the Komagatake Ropeway and Lake Ashi cruise will be changed to alternative itineraries. Furthermore, please note that refunds will not be issued in this case, and customers will not be notified separately when the schedule has been determined. 8. Please make sure to specify the meeting location and drop-off location at the time of booking. Please be aware that the specified meeting location and drop-off location may not be changed on the day of the tour. The bus may not stop by meeting locations and drop-off locations for which there are no prior reservations. 9. After sightseeing is finished, the bus may make multiple stops at hotels in the Hakone area for customers on tours with accommodation included. 10. Arrival time at Hakone-en, Odawara Station and Shinjuku may vary depending on the season and day of the week due to traffic conditions, and may be considerably delayed. Thank you for your understanding. Transportation may be delayed by traffic congestion. Even if you miss your Shinkansen after disembarking at Odawara Station due to a delay, no refunds will be given. Please ride the next train in the Non-reserved section. If you plan on taking a Shinkansen after the tour ends, please make sure to choose a Shinkansen departing Odawara Station at 19:00 or later. [Reference: Tours with return via Shinkansen] Tours from Dec. to Mar. depart Odawara Station between 17:00 and 18:30. Tours from Apr. to Nov. depart between 18:00 and 19:30. 11. The order of the tour itinerary is subject to change due to road conditions or other reasons. 12. Lunch is not included. Customers are to have lunch on their own. There may not be any cafes, restaurants, etc. where customers can have lunch near the rest area. We recommend preparing food to bring before departure or joining the tour with lunch included. 13. [Bus Company] Bus company used will be one of the following. Fuji Kyuko Kanko Co., Ltd.; Fuji Express Co., Ltd.; KM Kanko Bus Co., Ltd.; Hato Bus Co., Ltd.; Tokyo Yasaka Sightseeing Bus Co., Ltd.; Heisei Enterprise Co., Ltd.; Amore Kotsu Ltd., Tokyo Bus Co., Ltd.; Toto Kanko Bus Co., Ltd.; Chuo Kanko Co., Ltd.; Tokyo Limousine Co., Ltd.; or Tokyo Passenger Co., Ltd.